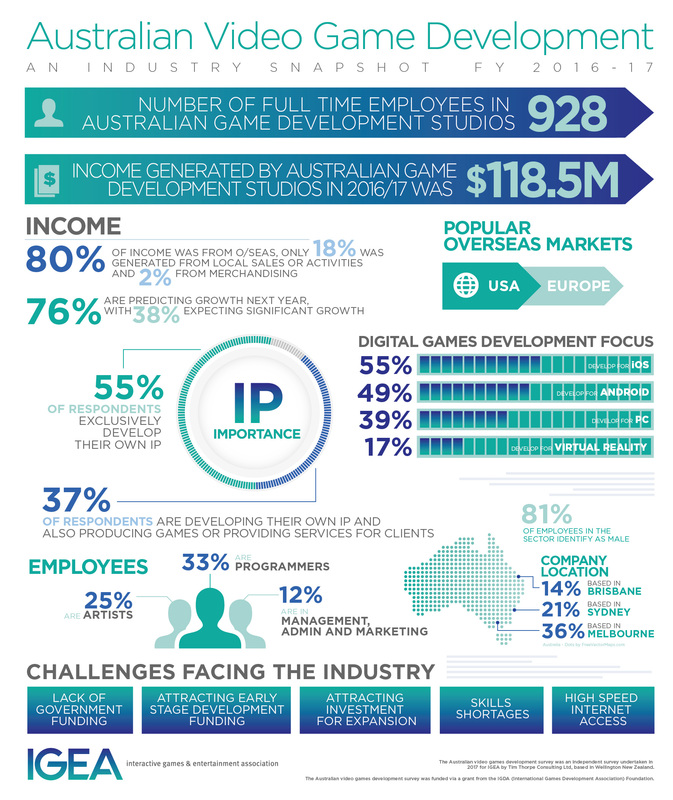 Sydney, Australia – 17 January 2018 – The Australian video game development industry continues to flourish, despite minimal recognition from the federal government, a survey of local game developers has shown. 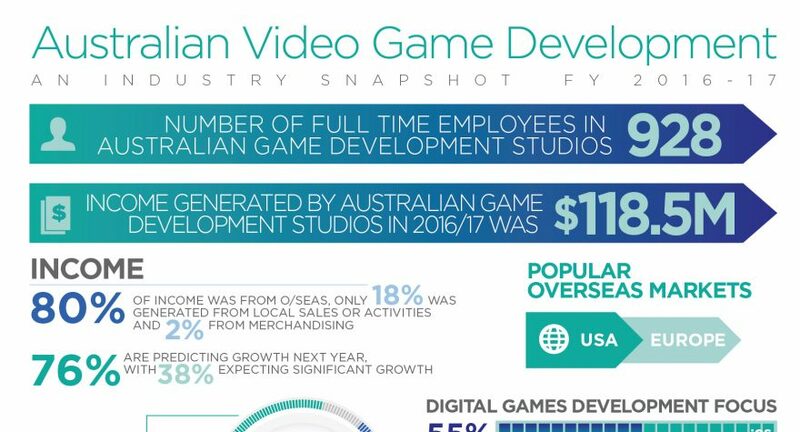 According to the survey undertaken for the Interactive Games & Entertainment Association (IGEA), the Australian game development industry generated $118.5 million in the 2016-17 financial year, with three-quarters of the studios surveyed projecting growth. The local industry employed 928 full-time equivalents, of which programmers (33%), artists (25%) and management, marketing and administration (12%) made up the majority. Fifty-three per cent of the companies surveyed said they plan to employ additional staff during the current financial year. Australian studios care about intellectual property, with more than half (55%) of respondents exclusively developing their own IP. A further 37 per cent develop their own IP alongside producing games and services for clients. The largest overseas market for Australian-developed content is the US, followed by Europe. Eighty per cent of the revenue generated by Australian studios came from overseas. Despite the industry’s modest growth and proven value to the Australian economy and screen sector, the industry continues to fight for recognition, acknowledgement and support from the federal government. Asked about the main challenges facing their industry, half of respondents considered the lack of government funding as stressful or very stressful. Only seven per cent said it was not a problem. The Senate’s Environment and Communications References Committee agrees. Following an inquiry into the local development sector in 2015-16, the committee made unanimous cross-party recommendations that would give the local industry a ‘hand up’ to help it compete on a more even playing field globally.2 Two additional government committees have since recommended funding for game developers be reinstated. Other challenges keeping developers up at night include attracting early-stage development funding and investment for expansion. Skill shortages are also a common concern, with a number of respondents believing changes to the 457 work visa will affect their business and/or employees. Local studios also noted the availability, cost and performance of the National Broadband Network as an ongoing problem. 18% of employees in the sector identify as female. When seeking new employees, 48% of respondents consider experience, qualifications and diversity equally. Melbourne has the heaviest concentration of studios (36%), followed by Sydney (21%), Brisbane (14%), Canberra (9%), Adelaide (5%), Perth (4%), Regional Vic (4%), Hobart (2%). The Australian game development industry survey is an independent survey undertaken for IGEA in August-December 2017 by Tim Thorpe Consulting Ltd, based in Wellington, New Zealand. The independent survey was distributed online to the video game development industry through IGEA’s networks and social media marketing, a distribution list of over 280 ASIC-registered companies, of which 114 provided useable responses. 1Brand, J. E., Todhunter, S. & Jervis, J. (2017). Digital Australia 2018. Eveleigh, NSW: IGEA. To speak with Ron Curry, CEO of IGEA, or an Australian game development studio, please contact Chelsea McLaughlin from Espresso Communications on 02 8016 2200 or chelsea@espressocomms.com.au.